English bond is considered as the strongest and most widely used brick bond in construction work. It consists of alternate course of headers and stretchers. In this arrangement, vertical joints in the header and stretcher courses come over each other. To break the vertical joints in the consecutive courses queen closer should be placed after the first header in every header course. In this brick bond, each course consists of alternate headers and stretchers. Every header is centrally supported over the stretchers below it. To break the vertical joints in the successive courses queen closers are placed in alternate courses next to the queen header. Bats are essentially required for the walls having their thickness equal to odd numbers of half bricks. Flemish bond gives better appearance than english bond. 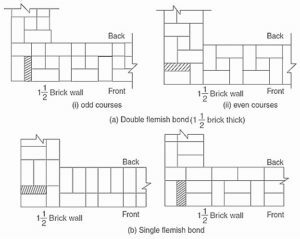 Flemish bond can be sub-divided into two different categories. English bond is much stronger than flemish bond for the walls thicker more than 1½ brick. Flemish bond shows more attractive and pleasing appearance of masonry work. Flemish bond is economical as it uses broken brick bats, although it requires some extra mortar for additional joints. Uses of flemish bond is a bit difficult than english bond. 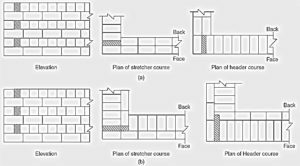 Flemish bond requires more skilled labour and supervision. ALSO READ – How to reduce bleeding in concrete? I’m student of civil engineering but i study in civil daily mor than university .. Love for u r page and special respect for Page admin’s. Exceptionally easy you’ve made. Easy to understand. Good job sir, pl keep doing. I like your channel…… Thank you for information….. I feel so happy…it’s very easy for understanding … awesome… keep your page active…and upload more and more articles.